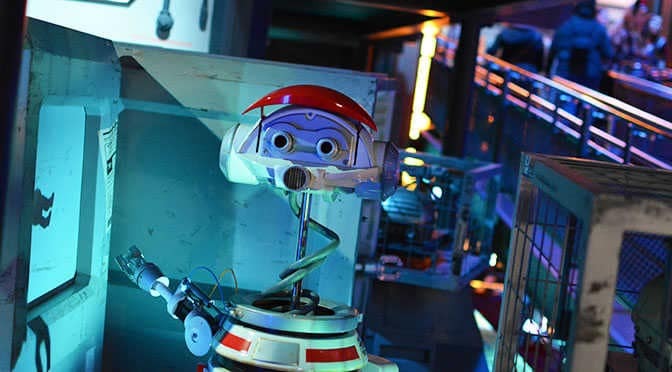 Star Tours now offers Star Wars: The Force Awakens sequence! The Star Tours Starspeedeer 1000 is fueled up and ready to take you on a new adventure. Beginning this morning, November 16, 2015, Star tours at Walt Disney World’s Hollywood Studios now takes you to Jakku in a scene right out of the upcoming Star Wars: the Force Awakens film. The new sequence will take place after the scanner droid examines the Starspeeder for the rebel spy and you take flight. The sequence was formerly occupied by travelling to Hoth, Kashyyk or Tatoonie. You’ll fly into this new world of Jakku and you’ll see the Millenium Falcon flying in front of you. A chase ensues with First Order TIE fighters. I won’t give away the ending for you. The following sequence will show a holographic sequence with BB-8 and R2-D2, then you complete you mission with one of the random ending sequences. It’s great fun! Other “Easter eggs” are also hidden in some of the other sequences. Are you looking forward to seeing the new segments. Previous PostEpcot Holidays around the World Guide 2016 including Storytellers schedules and touring planNext PostWill “Season of the Force” be canceled?